We are on the road with the Malt Whisky Association of Finland, and this time back to Scotland’s west coast. With three waves of tour guests arriving into Glasgow Airport, the locals were ducking for cover – hiding their whisky stocks. We named the trip The Celtic Rampage, after a highly successful Viking Raid last year! We drove to the first stop on this jam packed tour: Glengoyne Distillery, where their founders established their own tradition. No peat in the soil around Dumgoyne means no smokiness and nowhere for average casks to hide thus it flows through the slowest stills in Scotland. This maturing procuss, in fine sherry casks creates bold fruits and rich sweetness. A shopping frenzy for the Teapot was followed by a good tasting, still room and warehouse visits. From here to Loch Lomond Distillery, where a good pal of ours works and set up this exclusive tour. Having a history which goes back to at least 1772 with the founding of the Littlemill Distillery, they’ve amassed coopers, maltsters to still men and blenders – all share a deep love and knowledge of their craft. Their portfolio includes the Loch Lomond single malt, Inchmurrin, Glen Scotia a Campbeltown malt as well as several high quality blends. Aye, we were late departing – but it was a good visit, thanks to everyone there who helped. 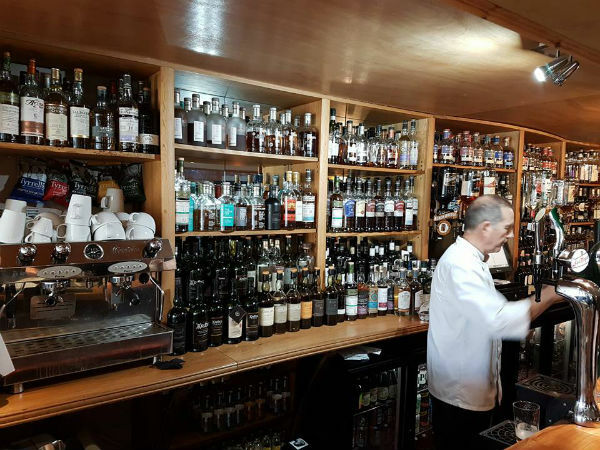 We then travelled along Loch Lomond and through the Argyll forest to Inveraray – all the way to Tarbert on Loch Fyne – where everyone split up looking for food and drink. And me? I had work to do, so stopped in with a dram and a tour to plan, but managed a drink or two in the bar with Mika alongside a couple of “rampagers”. Our Finish contingent thoroughly enjoyed themselves. Day 2 left our hotel at 06.15 for t he ferry to Islay, whisky island. 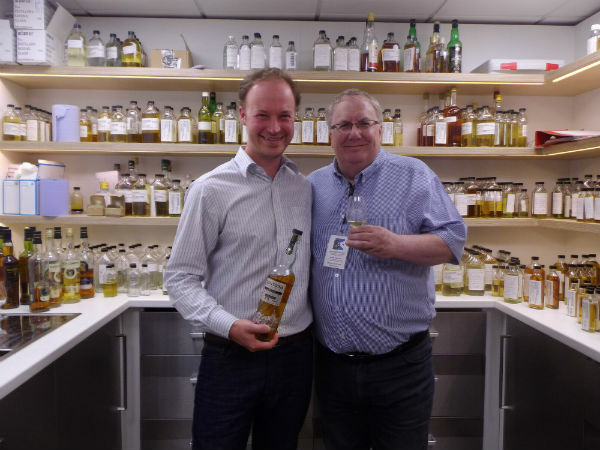 We headed to Laphroaig Distillery, (http://whiskytours.scot/whisky-interview-unusual-paul-mclean-interviews-bottle-laphroig) first a taste in the warehouse and a hand filled bottle each to carry out! Good start. Again we over ran our time (it’s a habit) – our taxi was waiting for us. Time for lunch, no ordinary lunch, oh no, we stopped at the Co op in Port Ellen for butties and juice, ate on board as we headed to Bunnahabhain Distillery for a great tour. Aye you guessed it – over ran again at the tasting. 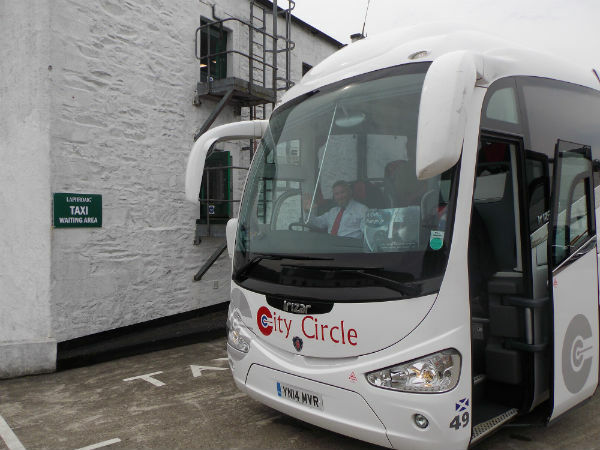 Back down to Lagavulin Distillery – I know, why go up and down the road like this? Distillery timings we needed to fit in with, och well. We made it, a final tour and taste and the compulsory shopping of course. It was about time for the hotel, but – time still for a dram or two yet, we got out the Merry’s Irish single malt whiskey, it went down well/easy, the dribbles remaining in the bottle went to our driver Raf for the night. This was followed by the Angels Whisky Club blend, a one off blend, this was enjoyed right down to the bottom of the bottle (a wee dram left for Raf). Hotel, relax, unpack, hit the bar, as the main bar was heaving, I wandered into the locals bar to watch Celtic win 5 – 2 in Europe, good day/night all round. There was much research done that night by all involved – except our poor driver. Day 3 a lie in, as we were booked into Bowmore Distillery at 10am, a great 2 hour tour and taste here, a very nice tasting followed, shopping and yet another “round up” as we headed (late) up to Ballygrant for a pre booked lunch/drink appointment. A superb 2 hour stay here, enjoying the food, many drams and beers, thanks Euan and David. Are we done? Nope, a wee drive to Islay Brewery again, sampling going on, followed by shopping, I hid inside as it was far too hot in the sun! Really! Are we done? Nope, over now to Bruichladdich Distillery for tasting and shopping, and aye, we stayed late to get the fill your own due to be ready approx. 5pm, many bottles filled believe me. Met Neil fae Mull at the hotel, chat, drinks then move to eat again, this time with many Fins in tow, a good meal and drinks, another good day. Day 4 an 8.30 start to get us to Port Ellen for the morning ferry back to Kennacraig, noon (ish) off and along the road down to Campbeltown, almost there and I gave a wee chat re Campbells and Macleans, as I finished my story, a part of the coach fell off! (honest to God, true) those Campbells still up to tricks, in the heavy rain we arrived at Springbank Distillery for the tour, which is most memorable for the warehouse tasting! Superb, and late again, over to Glen Scotia Distillery for the next tour; http://whiskytours.scot/interview-ian-mcalister-glenscotia-distillery small but good, good couple of tastings, shopping, thank you’s and back to Cadenhead shopping, over ran once again, there’s a theme here. Late back up the road to Tarbert again, a meal and a tasting, this was something different, 3 Kavalan drams; King Car single malt, Podium single malt and Solist Sherry finish. In the hotel back bar we enjoyed these with plenty of local craic and time to enjoy ourselves, Liz had joined us by now – these drams are bloomin good, favourites were; Podium, King Car then Sherry, which many thought too sherried for them. They are making really good, award winning, whisky over there and personally, I am a huge fan. Day 5 a 9am start for yet another ferry, this time a wee one, from Claonaig to Lochranza (Arran). We arrived early as it is non bookable and I needed to be sure we got on it! It is wee (photograph). Whilst waiting we opened a bottle of Jonnie Walker Black, 5 minutes later the bottle hit the bin at the ferry point. 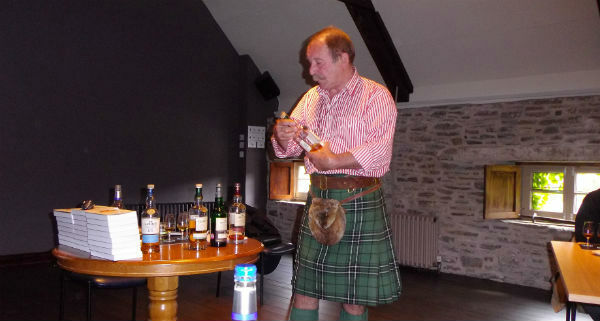 We also enjoyed a Cragganmore, am sure these guests/friends of ours don’t enjoy all this whisky at all! 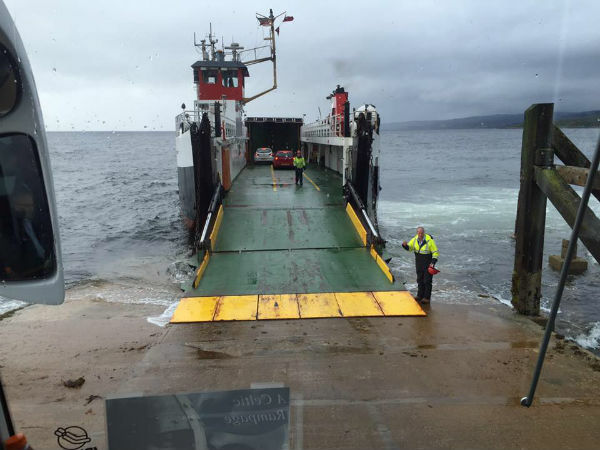 The ferry arrived – a floating ramp, it was choppy and as we de coached, many of us got wet! A great sail and landing at Lochranza, 5 minutes to the Arran Distillery, where Louisa was awaiting us. Our final distillery tour, quick look at the water source (in heavy rain) then a tasting of many grand drams. Brief distillery tour, shopping and sandwiches etc laid on for us. Er, fun and games followed. At Brodick ferry we arrived early, all pre booked and PRE PAID as usual. Passengers boarded off the coach, as the ferry sailed a tannoy message asked for me to see the captain. Off I toddled, to be told my coach, driver and Anders were NOT on the ferry. You might imagine I was not overjoyed, the captain and the purser got my drift, after a “chat” I was told they would be on the next ferry following us in 30 minutes. Was not a happy bunny. On arrival at Ardrossan we hit a bar to wait for the coach and others. Here comes the bus, all aboard and away to Glasgow for the night. City centre Glasgow on a Saturday night can be fun, Liz and myself bade our farewells and took a cab to our apartment. A GREAT TOUR WITH OUR FINISH FRIENDS YET AGAIN. Can I say a huge thank you to everyone on this tour, our friends at distilleries, hotels, visits and ferry crews (almost), there was much rampaging and Scotland is now short of many thousands of pounds worth of bottles, we are now thinking ahead to the next trip. Paul McLean; chief rampager and tour manager. Thanks Mika for all your help. People are as vital to Whisky as barley, malt and water. People make a tour great. “Great Rampage ! … thanks Paul and Liz”.